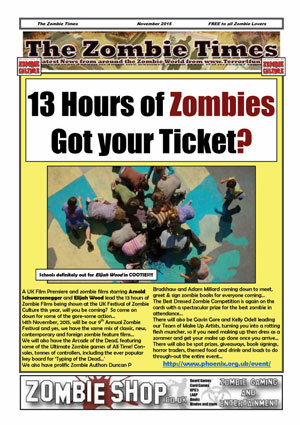 If you are making or releasing a zombie film or organising some form of zombie event, then please let us know and we will cover it for you in 'The Zombie Times' so that it will reach the thousands of people already signed up to our mailing list. If you would like to be sent 'The Zombie Times' every couple of months to let you know exactly what is going in the world of Zombies and Terror4fun, then please send us your email address! We will not pass your email address on to any other company or organisation. From this moment on you will be able to view 'The Zombie Times' right here, BUT if you want all of the latest news and not to miss out on the competitions then please join our mailing list.